Hi, my name is Killian. I was born in the 14th June 2014 at Holles Street, when I was born a blonde woman held me and she had tears rolling down her cheeks, she is my mother. My mammy and my dad seemed so happy to see me and I immediately felt safe and loved. Four weeks later I heard my parents talking about how my eyes shake when I look at them. They brought me to a nice man Dr Brian Lynch who said I'd have to have an MRI. After, I was put in this loud machine which took pictures of my brain. My mammy, daddy and I then went to see Dr Lynch and he told them I had a rare brain disease called Pelizaeus Merzbacher Disease! I didn't think anything was wrong with me, I looked at my Mam & Dad and both had tears falling, not happy ones that I seen when I was born but sad, heartbroken ones. We drove home that day in daddy's car and I never heard the car as quiet, mammy crying and daddy with tears in his eyes trying not to let them out. The doctor had told them that I would probably never walk unaided, talk properly and would need to be looked after for the rest of my life. At home for a while it wasn't the happy place I remembered my home to be. 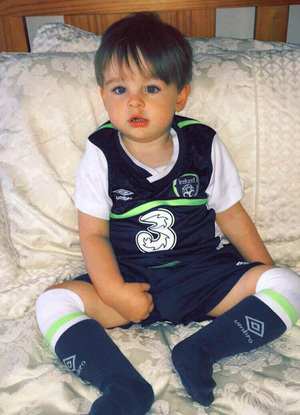 I'd wake up in my cot and hear my mammy & daddy crying, hugging each other, telling each other it will be ok.
Not long after that I started to be brought to physio where I do lots of exercises to help me get stronger, we go to Limerick every week for extra physio, I go to speech therapy and also occupational therapy every week. I hope I get stronger just to be able to sit on my own and eventually stand up all by myself. I can only imagine the look of happiness on my mammy & daddy's faces when I do. I have lots of help at home to help me, a stander, an activity chair and a special lowering seat for when I have a bath which I love. That's my story, it's fairly hectic considering I'm not even 2 and a half yet. I love my mammy & daddy so much and I know that they do so much for me. I hope that one day I can speak and tell my mammy that 'I love her' and that I can be strong enough to stand on my own and to kick a football to my daddy.